As a Strongman or Strongwoman competitor, it is common to do three or more contests a year. Most competitors will do a qualifier or two for nationals, compete in nationals, and possibly a follow up contest after nationals because it is within driving distance etc. While regularly competing in Strongman is by far the best way to gain sport specific skills and keep progressing in the sport, most competitors would benefit from implementing an “offseason” every 12 to 18 months. Sports following a traditional yearly periodized plan, such as football, have a dedicated time each year to drop sport specificity, work on aspects of general fitness (strength, muscular endurance, aerobic capacity, balance etc), and allow the athletes to recover from the wear and tear from the season. This same model can and should be implemented with regards to training for strongman due to the high stresses event training can place on bones, tendons, and ligaments. A short offseason of eight to ten weeks with no specific event training could drastically improve the recovery of tendons and ligaments that took a beating for the last 30 weeks of training. Most of us are familiar with taking deload weeks (I prefer the term “reload” week, just to be different) during training to allow our muscles a little more time to recover following high stress training weeks, and allow fatigue to dissipate before moving into the next moderate to high stress training week. A reload week is often enough time to dissipate fatigue and continue making progress in training, but it is not long enough to allow adequate recovery time for the connective tissues. Taking at least two months every year to work with lighter weights will improve an athlete’s longevity in the sport….and in a sport where strength is one of the main factors of success, time is everything due to how long it takes to reach peak strength. Immediately following a major competition, give yourself one to two weeks of active rest. You should not lift weights or do anything at a high intensity during this period to take full advantage of the recovery it offers. I recommend doing three 30 to 60-minute light aerobic workouts a week during an active rest period, such as hiking, biking, jogging, rowing, or using an elliptical. Just remember to keep the pace kind of easy (at least be able to maintain a full conversation during the work) and you will reap all the rewards of the active rest week(s). Think about it like this: if you have to recover from recovery work….it isn’t really recovery work, right? Smart. Let’s move onto the fun part of the offseason. Now that the active rest period is behind us let’s start building some muscle and a bigger aerobic base. The next six weeks will be dedicated to hypertrophy and pure aerobic work. During this phase you will lift four days a week, with 30 minutes of aerobic work done in the morning or immediately following two of the lifting sessions. Another option would be doing the aerobic work on two or three of the days you aren’t lifting, but most people would be better off taking advantage of three full rest days each week to recover from the increasing volume of the hypertrophy work. Either option works depending on schedule and how often you want to be in the gym each week. The hypertrophy work will start with sets of 8 on the main lift each day, then move on to sets of 10 and 12 before transitioning to the first strength block. All the assistance work will be between 10 and 20 reps during the entire block. For the aerobic work, I recommend starting around 65% of heart rate (HR) max for 30 minutes and working up to 70-75% of HR max by the end of the block. The following exercises can be swapped for any variation of the lift that is most comfortable or appropriate for the individual athlete performing the block. For example, if front squatting isn’t in the cards for you because of mobility issues, another squatting variation will suffice. Day 1 – Squat Front Squat – work up to 4 sets of 8 reps at a Rate of Perceived Exertion (RPE) 8. Rest 3-4 min between sets. Leg Press – 3 sets of 10-12 reps. Rest 2-3 min between sets. Lunges – 3 sets of 10-12 each leg. Rest 2-3 min between sets. Good mornings – 3 sets of 10-12 reps. Rest 2-3 min between sets. Aerobic work – 30 min at 65% HR max on a treadmill, bike, rower, or elliptical. Day 2 – Press Military Press – work up to 4-5 sets of 8 reps at an RPE 8. Rest 3-4 min between sets. One Arm Dumbbell (DB) press, Strict – 3 sets of 10-12 reps each arm. Rest 2-3 min between sets. DB lateral raises/front raises – 3 sets of 10 lateral/3 sets of 10 front. Rest 2 min between sets. Narrow Grip Pull Downs – 4 sets of 12-15 reps. Rest 2 min between sets. Bicep Work – any variation of curl you want for 3 sets of 15-20 reps. Rest 2 min between sets. Core Work – Isometric Hold (Planks, Side Planks, Ab Wheel Hold, Glute Ham Raise (GHR) Hold) for 3 sets of 40-60 sec. Rest 1-2 min between sets. Day 5 – Bench Bench Press – work up to 4-5 sets of 8 at an RPE 8. Rest 3-4 min between sets. Dips (use weight if needed) – 3 sets of 10-12 reps. Rest 2-3 min between sets. Incline DB bench – 3 sets of 10-12 reps. Rest 2-3 min between sets. Pull Downs, shoulder width grip – 4 sets of 12-15 reps. Rest 2 min between sets. Tricep work – any tricep extension variation you choose for 3 sets of 15-20 reps. Rest 2 min between sets. Core work – Isometric Hold (Planks, Side Planks, Ab Wheel Hold, GHR Hold) for 3 sets of 40-60 sec. Rest 1-2 min between sets. Day 7 – Rest Follow this weekly routine for all six weeks of the volume block, adjusting the reps and RPEs of the main lifts and assistance work in accordance with the tables below: Following the volume block you can take a reload week if needed or transition straight into the first intensity block. The first intensity block involves lifting three days a week on nonconsecutive days. For example: Mon/Wed/Fri, Tue/Thur/Sat, or Sun/Tue/Thur. You will end up doing the same lift every 9-10 days, which gives ample time for full recovery between sessions involving the same motor pattern (squat, hip hinge, press etc). Because you won’t be working off a traditional 7-day week let’s call each training week a microcycle for simplicity. This phase lasts five microcycles. You will add 5lbs to your bench workout and 10lbs to your squat workout each microcycle. The assistance work in this phase is focused on keeping volume high to continue building muscle. The main differences between the volume block and this first intensity block will be the amount of volume done on the main lift, the inclusion of plyometric work, and switching the aerobic focus to anaerobic. The first intensity block will focus on building rep PRs on the squat and bench, while keeping the main work on the press and deadlift more traditional strength building work with sets of 5. It is not necessary to simultaneously push the squat and deadlift in the same block. The movements are very similar mechanically so train one lift hard and keep a maintenance focus on the other. The same principle applies to the military press and the bench press. The easiest way to stall progress on a specific movement is to try and focus on building everything at once. Use this block to build the squat and bench press, and you will be set up perfectly for the second intensity block. Day 1 – Bench Press Plyometric Push Ups – any variation you choose for a total of 15-25 reps. Bench Press – Work up to 3×3 at an RPE 7 resting 3 min between sets. Rest 5-6 minutes and take the same weight you used for the 3×3 to do a 4th set for an “as many reps as possible” (AMRAP) set. Super set with Pull ups*. Do the 3×3 with minimal psyching up or mental exertion. Save that for the AMRAP set and try to hit a 5lb or 1 rep PR from the previous microcycle’s performance. Add 5lbs each microcycle. Dumbbell Military – 3×10 Rest 1-2 min between sets. Super set with Pull ups. Pull ups or Pull Downs – 8 sets of 6-10 reps total done throughout your main pressing sets. Rest 1 min or less between pressing and doing your pull ups. Lateral raise – 3×10-15 use very strict form and a lighter weight…keep the rep tempo slower and get as much time under tension as possible on the negative. Seated Row – 3×10-12 Strict form and a 2ct pause on at the top. Day 2 – Short Anaerobic Work Prowler Push – 8 to 12 sets of 30 seconds of work. Rest 2.5 min between each set. Day 3 – Deadlift Warm up Broad Jumps – 5×3 Deadlift – Work up to 4 sets of 5 reps at an RPE 8-9. Rest 3 – 5 min between sets. Barbell Row – 3 sets of 10-12 reps. Rest 2-3 min between sets. Leg Press or Hack Squat – 3 sets of 10-12 reps. Rest 2-3 min between sets. 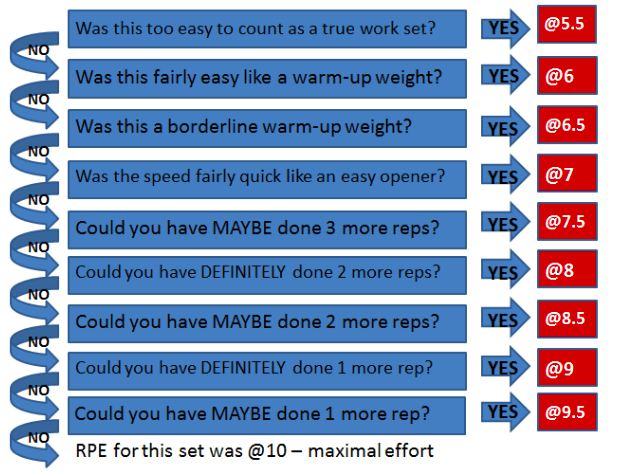 GHR – 3 sets of 8-10. Use strict form and stop at parallel for a quick pause to make the exercise harder, if it isn’t difficult to get 10 reps. Rest 2-3 min between sets. Planks – 3 sets of 60 sec with weights, add weight if you can. Day 5 – Military Press Plyometric Push Ups – any variation you choose for a total of 15-25 reps. Military press – Work up to 4 sets of 5 reps at an RPE 8-9. Rest 3 – 5 min between sets. Super set with Pull ups. Incline Dumbbell press – 3 sets of 10-12 reps. Rest 1-2 min between sets. Super set with Pull ups. Pull ups or Pull downs* – 7 sets of 6-10 reps total done throughout your main pressing sets. Rest 1 min or less between pressing and doing your pull ups. Pec Fly/Pec Deck machine/cable crossover – pick an exercise and do 3 sets of 10-15 use very strict form and a lighter weight…keep the rep tempo slower and get some time under tension on the negative. One arm DB Row – 3 sets of 10-12 reps. Use strict form and a 2ct pause at the top. Day 6 – Long Anaerobic Work Assault Bike or Rower – 6 to 8 sets of 60 to 80 seconds of work. Rest 3 min between sets. Day 7 – Squat Box Jumps – 5×3 Squat – work up to 3×3 at an RPE 7 with 3 min rest between sets. Rest 5-6 minutes and use the same weight for a 4th AMRAP set. Do the 3×3 with minimal psyching up, mental exertion, or aggression. Save that for the AMRAP set and try to hit a 10lb or 1 rep PR from the previous microcycle’s performance. Add 10lbs each microcycle. Front Squat – 3 sets of 10-12 reps. Rest 2-3 min between sets. T bar Row – 4 sets of 10-15. Rest 2-3 min between sets. Use very strict form. These are a rowing movement, not a leg movement. Romanian Deadlift – 3 sets of 6-8 reps. Use strict form and stop below the knees for a 2ct pause. Rest 2-3 min between sets. Side Planks – 2 sets of 60 sec each side, add weight if you can. 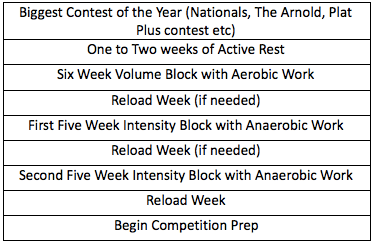 Day 8 – Rest Following the first intensity block is another opportunity to take a reload week. If you do not feel you need a down week to dissipate some fatigue you can transition straight into the second intensity block. The second intensity block still involves lifting three days a week on nonconsecutive days. Again, you will end up doing the same lift every 9-10 days which gives ample time for full recovery between sessions involving the same motor pattern. This phase also lasts five microcycles. You will add 5lbs to your military press workout and 10lbs to your deadlift workout each microcycle. The assistance work is the same as the first intensity block. The main differences between the first and second intensity block will be which lifts you are focusing on building via rep PRs. This phase will focus on building rep PRs on the military press and deadlift to successfully transition you into your next competition prep. I believe using the first intensity block to build the squat and bench sets this block up perfectly. Hitting some new rep PRs will build a ton of confidence in your overhead pressing and deadlifting before starting to train for an upcoming contest. Because the overhead press and deadlift are strongman staples, it is appropriate to end the offseason by gradually transitioning back to more sport specific work. Day 1 – Bench Press Plyometric Push Ups – any variation you choose for a total of 15-25 reps. Bench Press – Work up to 4 sets of 5 reps at an RPE 8-9. Rest 3 – 5 min between sets. Super set with Pull ups. Dumbbell Military – 3 sets 10-12 reps. Rest 1-2 min between sets. Super set with Pull ups. Pull ups or Pull Downs* – 8 sets of 6-10 reps total done throughout your main pressing sets. Rest 1 min or less between pressing and doing your pull ups. Lateral raise – 3 sets of 10-15. Use very strict form and a lighter weight…keep the rep tempo slower and get as much time under tension as possible on the negative. Seated Row – 3×10-12 Strict form and a 2ct pause on at the top. Day 2 – Short Anaerobic Work Prowler Push or Hill Sprints – 12 to 16 sets of 20-25 seconds of work. Rest 2 min between each set. Day 3 – Deadlift Warm up Broad Jumps – 5×3 Deadlift – work up to 3×3 at an RPE 7 with 3 min rest between sets. Rest 5-6 minutes and use the same weight for a 4th AMRAP set. Do the 3×3 with minimal psyching up, mental exertion, or aggression. Save that for the AMRAP set and try to hit a 10lb or 1 rep PR from the previous microcycle’s performance. Add 10lbs each microcycle. Barbell Row – 3 sets of 10-12 reps. Rest 2-3 min between sets. Leg Press or Hack Squat – 3 sets of 10-12 reps. Rest 2-3 min between sets. GHR – 3 sets of 8-10 reps. Use strict form and stop at parallel for a quick pause to make the exercise harder, if it isn’t difficult to get 10 reps. Rest 2-3 min between sets. Planks – 3 sets of 60 sec with weights, add weight if you can. Day 5 – Military Press Plyometric Push Ups – any variation you choose for a total of 15-25 reps. Military press – Work up to 3×3 at an RPE 7 resting 3 min between sets. Rest 5-6 minutes and take the same weight for a 4th AMRAP set. Super set with Pull ups*. Do the 3×3 with minimal psyching up or mental exertion. Save that for the AMRAP set and try to hit a 5lb or 1 rep PR from the previous microcycle’s performance. Add 5lbs each microcycle. Incline Dumbbell press – 3 sets of 10-12 reps. Rest 1-2 min between sets. Super set with Pull ups. Pull ups or Pull downs – 7 sets of 6-10 reps total done throughout your main pressing sets. Rest 1 min or less between pressing and doing your pull ups. Pec Fly/Pec Deck machine/cable crossover – pick an exercise and do 3×10-15 use very strict form and a lighter weight…keep the rep tempo slower and get some time under tension on the negative. One arm DB Row – 3 sets of 10-12 reps. Use strict form and a 2ct pause at the top. Day 6 – Long Anaerobic Work Assault Bike or Rower – 5 to 8 sets of 70 to 90 seconds of work. Rest 3 min between sets. Day 7 – Squat Box Jumps – 5×3 Squat – Work up to 4 sets of 5 reps at an RPE 8-9. Rest 3 – 5 min between sets. Front Squat – 3 sets of 10-12 reps. Rest 2-3 min between sets. T bar Row – 4 sets of 10-15 reps. Rest 2-3 min between sets. Romanian Deadlift – 3 sets of 6-8 reps. Use strict form and stop below the knees for a 2ct pause. Rest 2-3 min between sets. Side Planks – 2 sets of 60 sec each side, add weight if you can.